At Pimlico Painters & Decorators we have strong established links with Facility Management Companies. We have a team that will work with Facility and onsite Management to ensure the project is carried out with minimum disruption. We understand your premises appearance reflects directly on your business in terms of client perception, staff morale, motivation and ultimately business performance. No job is too big or too small, we are aware that scheduling and timeliness are important. We can work around your business, during weekends or evenings to ensure minimum disruption to your business’s day to day activities. We deliver a high quality of work, on schedule and to budget using the best materials and attention to detail from our management and supervisory team. 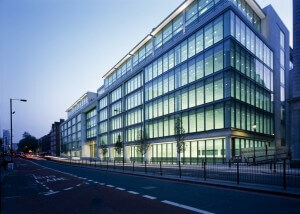 Our latest ongoing project is at Google’s Central London headquarters, Belgrave House. We are undertaking an extensive program of redecorating office space, communal areas, and hall ways at this large corporate premises. Temporary Suspended Access Equipment – This allows our team to work on and operate a cradle platform. Health & Safety in the workplace – 2016 certificate. We are fully CHAS accredited, The Contractors Health and Safety Assessment Scheme. Public liability insurance of up to £5,000,000 and Employers liability insurance of up to £10,000,000 – We pride ourselves on offering customers a professional and trustworthy service and this includes making sure you, the customer, are covered. We will carry our a full risk assessment prior to commencement of work, and provide a full site specific RAMS statement to each client, in advance for each project.